This year’s graduation exhibit at the Freda Diesing School was held on April 19 and 20. It was by far the weakest of the five I have attended. In previous years, there have always been one or two students who were ready to become professional artists, but this year there were none, although a reassonably large number could be ready if they keep working for another year or two. Unfortunately, this year’s show featured too many shaky hands on the paint brush and failures to find the grain. Too often, what passed at a distance was flawed close up. However, that’s not to say that the exhibit was disappointing – just that it could have been better. The longhouse on the Terrace campus of Northwest Community College is always worth a lingering visit, and I never object to a preview of those who might become promising new artists in another few years. 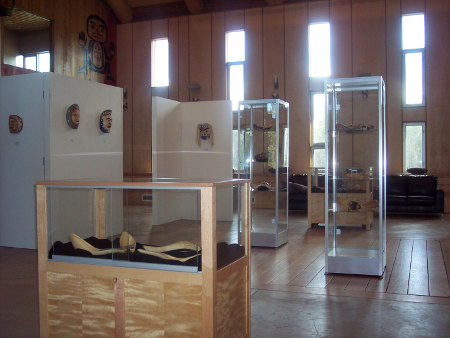 The work of many of the best artists was visible in the display of paddles at the entrance. 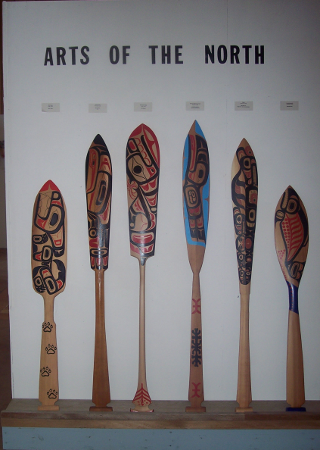 This is probably no accident, since a painted paddle is one of the first assignments given to students in the school, so students had plenty of time to perfect their results. Most of the pictures in the show will be in The Spirit Wrestler Gallery’s “Northern Exposure” show in Vancouver at the end of May. Several students were also planning to add additional pieces for the southern show, which I look forward to seeing. As always, I anticipate that show, but I look forward even more to seeing what first year students like Robert Quock and Lorretta Quock Sort will be doing next year, with another twelve months of development. 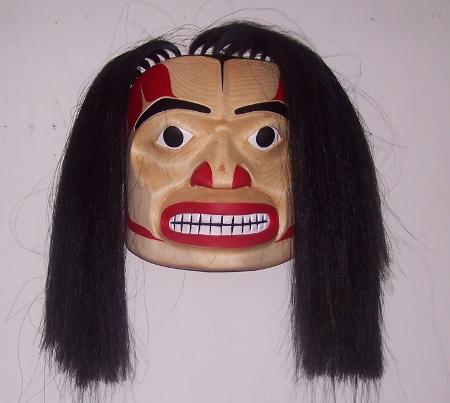 When Angelo Cavagnaro was completing his projects for his second year at the Freda Diesing School of Northwest Coast Arts, senior adviser Dempsey Bob stopped by his work bench. 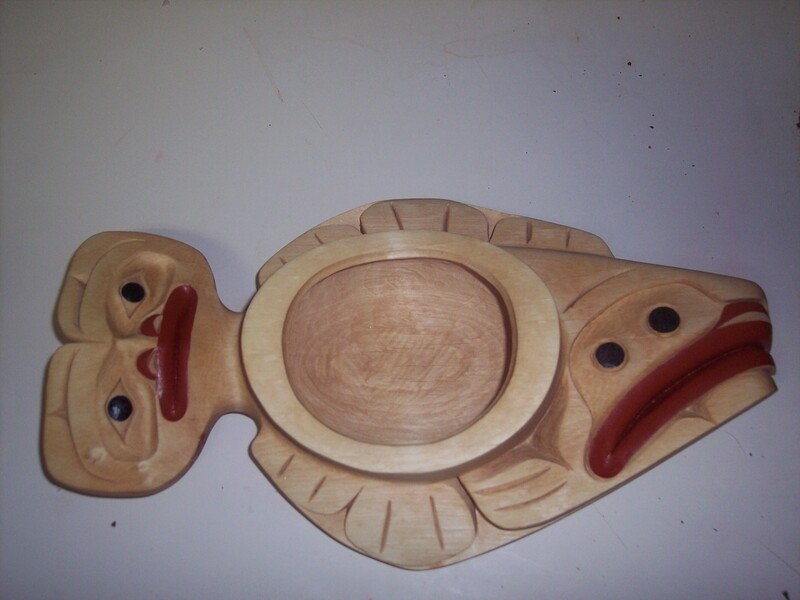 Cavagnaro says that he had intended the bowl to be a halibut, as its shape and the two eyes on one side suggests. However, remembering Bob’s comment, he named it“ Supernatural Flounder.” It’s a fittingly whimsical title for what I consider a whimsical piece. 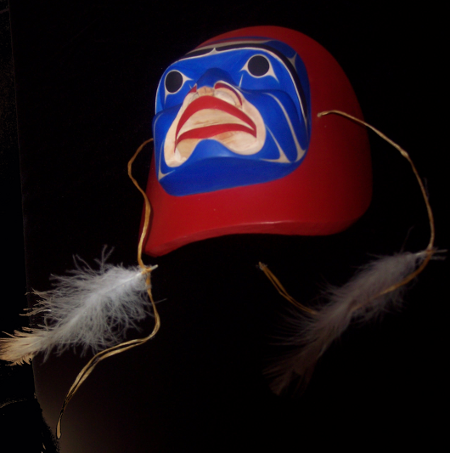 “Supernatural Flounder” reflects not only the importance of fishing to traditional Northwest Coast cultures, but of grease. 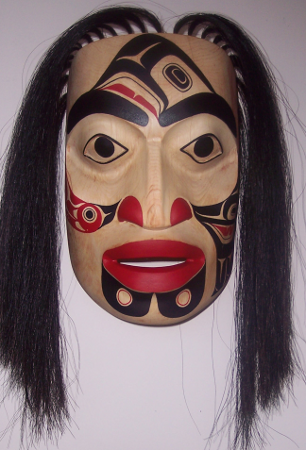 While the northwest coast of North America historically supplied the abundance of food necessary for cultures centered on status and art, the diet was low in fat, or grease as it was generally known. Just as in medieval Europe, people craved grease incessantly. In fact. stores of grease – usually from the oily oolichan or candle fish, whose season was in early spring, when supplies would be at their lowest – were a sign of wealth. To this day, it remains a traditional delicacy. Historically, it was a treat at feasts and ceremonies, where it would be served to guests in highly decorated bowls. Some of these bowls were about the size of Cavagnaro’s piece, holding enough grease for a single serving. Others were a couple of metres long, and must have served dozens. “Supernatural Flounder” is a transformation piece, like many that I have bought. The human face in the tail suggests that the fish – whether halibut or flounder – is one of those supernatural creatures that can assume human form. Many depictions of such creatures show them in the moment of transition, which is often shown as dramatically agonizing, like some of the computer-generated transformations of werewolves in modern horror films. However, Cavagnaro takes a somewhat different approach. The body of the bowl is simply carved, with fins indicated by rough shapes scored with a couple of lines apiece. That leaves the human and fish faces to be emphasized, their lips and nostrils painted with the same red, and their eyes with the same black. There are differences in the shapes of the eyes and their sockets, but if you look at the piece long enough, the resemblance is undeniable. Both have the same blankness, inviting a comparison which explains why I call the piece whimsical – in the end, the human face ends up looking not that different from the fish’s. The result is a creature that looks at home with its dual nature, whose stomach just happens to be where the bowl is. 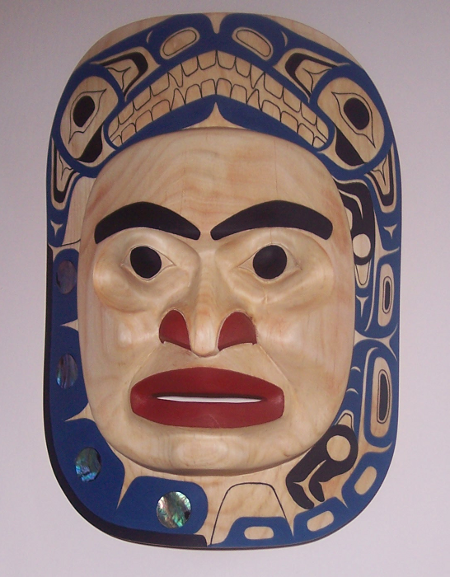 As a carving, “Supernatural Flounder” could stand more attention to finishing details. The interior of the bowl is rough, and there are many places on the carving where the artist’s working against the grain is still obvious. On a piece that is so minimally painted, such details stand out, and need to be thought about. But the general shape and proportions is well-thought out, and Cavagnaro shows the same steady hand on the paint brush as in his other works. In the end, the bowl turned out to be the only piece I bought at the graduate show. 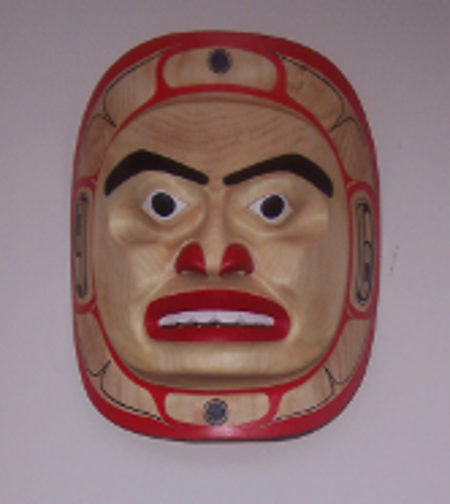 As I write, it sits on a sideboard a few paces away, where I can enjoy by turning my head a few centimeters. Last weekend, I flew north to Terrace to give out the Mature Student Award at the Freda Diesing School graduation. This was the fourth year I have sponsored the award, and the third in which one main recipient and two honorable mentions were named. The award honors students twenty-five and older, recognizing that returning students face challenges in returning to school that younger students don’t, yet often contribute grreatly to a class. 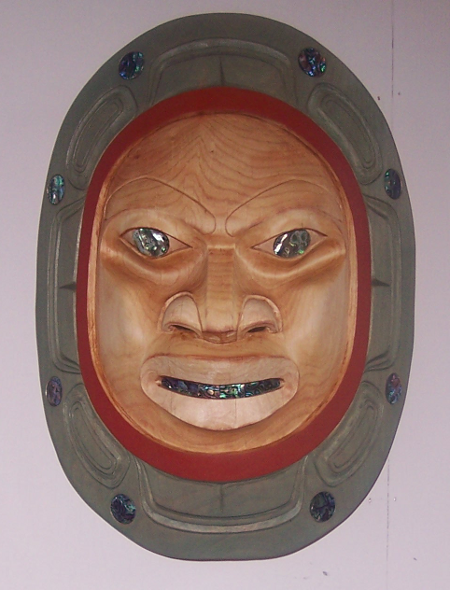 The main recipient was Steven Wesley, a member of the Eagle side of the Haida Nation. Wesley fished for many years, then returned to school in 1997 to earn his high school diploma. “I wanted to be a role model for my daughters,” he said. “I wanted to show them that even their Dad could get his Grade Twelve. Wesley went on to become a bus driver and trucker. 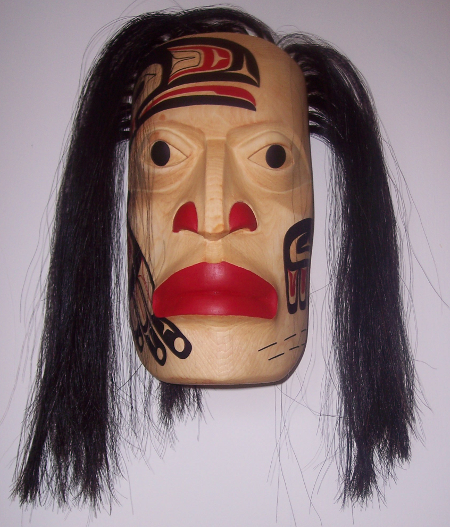 However, he relates that, in 2002, “A friend handed me a knife and a block of wood and asked if I wanted to carve. And ever since I kept pursuing my dream of becoming an artist,” he says. He plans to return for his second year in September, and to carve and paint over the summer. “The more you carve, the less you forget,” he says. Quock also plans to return for her second year, studying beside her brother Lyle. 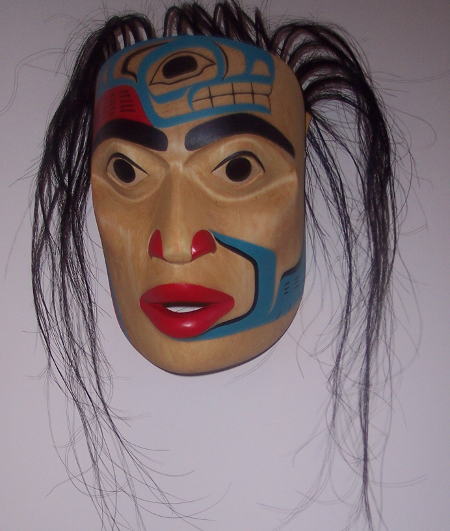 The other honorable mention went to Lorretta Quock Sort, a Tahltan of the Crow Clan. An experienced textile artist, for some time Sort has been making fire bags (ammunition pouches) that the president of the Tahltan nation has been distributing as gifts. Like the other winners, Sort plans to keep busy over the summer. She has already set herself the task of doing a mask and bowl over the summer, as well commissions for two button blankets and more fire bags, which these days are popular as women’s purses. Wesley, Quock, and Sort were all among the more accomplished students in this year’s exhibition. I look forward to seeing them develop in their second year, and I’m pleased to have played a small role in their development as artists. Some years ago, the Vancouver Folk Festival included an activist for the disabled. When an announcer on one of the afternoon stages called him “differently abled,” he immediately took over the microphone. I think of his reply sometimes when I see articles prefaced with a trigger warning that they discuss potentially disturbing topics. Then I wonder if the warnings really do anything for the people they are supposed to help. To start with, isn’t a title supposed to make clear what you are talking about? With any halfway conscientious writer, most trigger warnings are redundant. More importantly, I question whether the average traumatized person wants to be sheltered from potential upset. Possibly, just after their trauma they would prefer not to dwell on what happened. But, more than anything else, the people I know who suffer from long-term trauma have a tremendous desire to cope. They want to appear normal, even if that appearance is an illusion. They don’t want to stand out, or to talk about their problems, or to be given more special treatment than is absolutely necessary. From this perspective, a trigger warning is not a kindness or a piece of politeness. It’s an implication that they can’t manage – that all their carefully constructed defenses aren’t enough, and that, although they are survivors, their survival tactics aren’t enough. In their minds, I am told, such implications are, if not actually an insult, then a dismissal of their ability to survive. The truly traumatized (by which I mean the raped and assaulted, and the people with Post Traumatic Stress Disorder, not the upper middle class professional feeling thwarted at work) often take great pride in their ability to cope, so they are not going to appreciate any suggestion that they can’t. In fact, their obsession with passing for normal is so great that a surprising number of those suffering from long-term trauma have said that, if a treatment could make them forget what happened or somehow remove its effects upon them, they would refuse it. A magic removal of their trauma would be a denial of the pride they take in having survived. Yes, a trigger warning might spare them. But many of the traumatized don’t want to be spared. They want to prove, if only to themselves, that they can survive to some degree, even when faced with topics related to their conditions. This desire exists even when they encounter a trigger warning when browsing the Internet by themselves, and independent of how well they actually can rise above everything. In effect, a trigger warning is an invitation for the traumatized to relax and spare themselves pain. Yet that is something that the traumatized cannot do with most people or in most situations. If they are lucky, they might be able to relax with a lover or a close friend, and resist the temptation to read past the trigger warning. But in most cases and with most people, the trigger is likely to be a challenge. If anything, some of the traumatized whom I know would be all the more tempted to click a link with a trigger warning, just to test themselves. Those who provide trigger warnings mean well. The warnings are not just runaway political correctness, as conservatives have been known to suggest. But in their effort to pass for normal, few of the traumatized appreciate the effort to give them special consideration. From what I’ve seen, most of them would be more grateful if you let them face whatever happened along without any illusions and didn’t single them out for special treatment. A trigger warning might seem to be a kindness. But from a traumatic perspective, it may be a subtler cruelty than a direct insult. When I hear fundamentalists preaching hate and atheists ranting against organized religion, I am proud to be agnostic. It seems the only intellectual and moral position with any integrity. It seems the simplest position to take – the only one that avoids obsession and allows me to appreciate the Christian culture of the past while neither overvaluing it nor repudiating it. In fact, agnosticism has a sub-culture of its own that is more satisfyingly complex — and therefore closer to the real state of humanity — than fervent belief or unbelief. When I call myself an agnostic, I mean that I take no position on the question of whether a deity exists. Given the existing evidence, I tend to doubt it. However, I reserve the right to change my mind if any evidence worth considering comes along. I suppose that if you define deity as the underlying structure of the universe, I might grudgingly call myself a pantheist. But, while that structure deserves my admiration, I see no reason to worship it, or to think that it is sentient and would receive or want my worship. So, on the whole, I remain an agnostic. One of the major advantages of this position is that I can put aside all questions about religion and get on with my life. This is something that neither the religious or atheistic can manage to do. On the one hand, the religious obsess over what their creed would have them to, abdicating personal responsibility for their morality, as if they are overgrown children. On the other hand, most of the atheists I know obsess over religion at least as much as the faithful — and often more. Like alcoholics, they are pre-occupied about what they have given up, so much so that the average atheist could be described in the language of addiction as a recovering Christian or a recovering Buddhist. By contrast, as an agnostic I no longer concern myself with faith or lack of it. Both are equally irrelevant so far as I am concerned, and if I am somewhat closer in outlook to an atheist than to a believer, unlike both I let go. That is not to say that religion holds no interest to me. Nothing that occupied so much of humanity’s attention for so many centuries can be unimportant if you are interested in history. Over the years, I have read a variety of Christian, Islamic, and Jewish texts as well as some Buddhist, Hindu, Sikh, Sufi and Zen texts. But I approach them from a scholarly perspective. For the most part, they are not instructions about how to live and think, but rather a record of how people believed they should live and think in the past. Encountering these beliefs can be fascinating, but I have no more urge to imitate them than I do to wear a toga or carry an assegai. The same is true of art and history. Although religion has clearly inspired great art, I do not look for prove of my convictions in that inspiration. Nor do I expect archeology or newly discovered documents to confirm the truth of what is presented in the Bible or any other religious text. Yet, at the same time, I feel no need to repudiate my culture’s religious past. I accept and appreciate it as an interesting example of the varieties of human experience, recognizing that it has probably shaped my thoughts to an extent – even in a post-Christian era – and see no need to dismiss the outlooks of my ancestors. As an agnostic, I have not repudiated my past so much as repositioned myself in relation to it. To others, I know, this perspective is intolerable. Nor, in fact, is it always easy. But I have concluded that my two-way doubt is an accurate perception – or at least a more accurate one that faith or non-faith. There is a terrible certainty about faith or non-faith alike that too easily becomes strident and simplistic. What I appreciate about agnosticism is that it encourages perception and acceptance of ambiguity. That is why, I suspect, that the English language novel did not manage to come into its own until the skepticism of the nineteenth century set in. Strong convictions make effective polemics, but they discourage observation and meditation. That is why there is such a rich sub-culture of agnosticism in the works of writers like George Eliot and Thomas Hardy. In such writers, the uncertainty of belief leads to a closer examination of people and their habitual behavior – and, ultimately, as the nineteenth century gave way to the twentieth, to psychology. Agnosticism has no grand statements about human existence. If it did, then by definition it would not be agnosticism. But as a perspective, as a stance in relation to the rest of the world, it seems less self-deceiving and more self-correcting than either faith or atheism can ever hope to be. Agnosticism has no pre-conceived perspective, which makes it the philosophical position of choice for those who prefer to know the world as it is rather than how they would like it to be.